Note: These listings are provided as a service only, and they do not imply sponsorship or endorsement by The Global Cat or Toot’n Media Group. Since listed information is subject to change, contact the event organizer before making travel plans. Links to cat show schedules listed below may be in either MS Word (DOC or DOCX) or Adobe PDF format. To install the latest version of the free Adobe Reader, please download a copy of the program from Adobe.com. Public Show Hours: 10 a.m. to 4 p.m.
Information: Harriet Seehusen, 901 E. Salem, Indianola, IA 50125; (515) 961-8495; [email protected]. Information: Judy Eastwood, (317) 288-8349; [email protected]; or Karly Chnupa, 6212 U.S. Hwy. 6, #204, Portage, IN 46368; (219) 678-5049 (from 5 p.m. to 9 p.m. CST); [email protected]. Venue: Hiroshima Prefecture Industrial Hall, 12-18 Jijiyama-Honmachi. Information: Ms. Kyoko Nishimoto, 2-18-4-2, Hataka, Aki-ku, Hiroshima 738-0088; +81-82-827-1696; [email protected]. Venue: German-American Club, 8096 66th St.
Information: Margie Hopman, 811 Phoenix Ave., Fruitland Park, FL 34731; (352) 314-9298; [email protected]; or Gloria Thomas, (386) 747-8802; [email protected]; schedule (DOC). Venue: Evergreen State Fairgrounds, 14405 179th Ave. SE. Information: Sue Sanderlin-Berry; [email protected]. Venue: Halifax Forum, Maritime Hall. Venue: Oaks Middle School, 1221 South Oaks Ave.
Information: Lisa Marie Kuta, 918 Geneva St., Glendale, CA 91207; (818) 269-3756; [email protected]. Venue: Saffin Center, 3926 Poplar Level Rd. Information: P-K Services, 239 Mitchell Rd., Wilmington, OH 45177; (937) 382-8100; [email protected]. Venue: Pabellon Deportivo Cultural Moraleja de Enmedi, Calle Mirasierra, 61. Information: Raquel Dominguez Lopez, C/Rincon 5, Villamayor, Salamanca 37185, Spain; 34661489306; [email protected]. Venue: I-X Center, 1 I-X Center Dr.
Information: Monte Phillips, 2N474 Woodcrest Dr., West Chicago, IL 60185; (630) 936-7161; [email protected]. Venue: Sanford Civic Center, 401 Seminole Blvd. Information: Shirley Peet, 415 Shore Dr., Joppa, MD 21085; (410) 679-1873; [email protected]. Venue: Bucksmont Indoor Sports Center, 2278 Penn Rd. Information: David & Shirley Peet, 415 Shore Dr., Joppa, MD 21085; (410) 679-1873; [email protected]. Venue: Tianjin Meijiang International Expo Center, No. 18, Youyi South Rd., Xi Qing District. Information: Yan Lee, 9B, 714 Prince Edward Rd., Kowloon, Hong Kong; 85297328183; [email protected]. Venue: Dar El HAreb Elektroneh, Omar Ebn El Khatab St. Branched of El Nacr Rd. Information: Adham Abdou Ahmed, 36 Hassan Ibrahim St., Branched of Makram Ebied St./Nacr City, Cairo 11381, Egypt; 00201226578956; [email protected]. Venue: Arcadia Masonic Lodge, 50 W. Duarte Rd. Information: Lisa Kuta, 918 Geneva St., Glendale, CA 91207; (818) 269-3756; [email protected]. Venue: Neal Blaisdell Center, Pikake Room, 777 Ward Ave.
Information: Andrew Chun, 4960 Mana Pl., Honolulu, HI 96816; (808) 722-6955; [email protected]. Venue: Mesquite Convention Center, 1700 Rodeo Dr.
Information: Sheryl Zink, 6427 Singing Creek Ln., Spring, TX 77379; (281) 379-3897; [email protected]. Venue: SM Shopping Mall, No. 29 Jian She Rd. Venue: Hampton Inn and Suites, 1700 Rodeo Dr.
Venue: Souths Sports Club, Brandon Park Reserve, Mortimer Rd. Public Show Hours: 8:30 a.m. to 4 p.m.
Venue: Wellington Reserve Community Centre, 36-42 Mackie Rd. Public Show Hours: 10:30 a.m. to 3 p.m.
Information: Suzanne, [email protected]; schedule (PDF). Venue: Tashkent, 19 (entrance 50), Chizhovka-Arena Universal Hall. Venue: Parc des Expositions, 16 Avenue Georges Clemenceau. Public Show Hours: 10 a.m. to 7 p.m.
Information: [email protected]; schedule (PDF). Venue: Parc Floral de Vincennes, Route du Champ de Manoeuvres. Information: Nicolas Revenant, +33 (0)6.71.61.48.45; [email protected]; or [email protected]; schedule (PDF). Public Show Hours: Saturday, 10 a.m. to 7 p.m.; Sunday, 10 a.m. to 5 p.m.
Information: Aina Hauge, [email protected]; or [email protected]; schedule (PDF). Venue: Celje Fair, Hall E, Dečkova 1. Public Show Hours: Saturday, 10 a.m. to 7 p.m.; Sunday, 10 a.m. to 6 p.m.
Information: [email protected]; or [email protected]; schedule (PDF). Venue: Marsh Academy Leisure Centre, Station Rd. Information: Wendy Chapman, 4 Brussels Close, Dovercourt, Essex CO12 3SF; 01255 502568; [email protected]; or [email protected]; schedule (PDF). Venue: Linna Hotelli, Kaikulantie 86. Public Show Hours: Saturday, 10 a.m. to 4 p.m.; Sunday, 9:30 a.m. to 4 p.m.
Information: [email protected]; or [email protected]. Venue: Hanzehal, Fanny Blankers-Koenweg 2. Venue: Hala Sportowa Uniwersytetu W Bialymstoku, ul. Swierkowa 20A. Venue: Lenexpo, Pavilion 7, Bolshoi Prospekt VO, 103. Venue: Markthalle – Sägegasse 19-3400. Public Show Hours: 10 a.m. to 6 p.m.
Venue: Social house/Společenský dům/Zdice, Husova 369. Information: Martina Nováčková, Sládkova 210, Rokycany III, 337 01; +420724577291; [email protected]; or [email protected]; schedule (PDF). Venue: KFUM hallerne, Peter Tofts Vej 21. Public Show Hours: 10 a.m. to 5 p.m.
Venue: Salle polyvalente, 12 rue de Merxheim. Venue: Parc des Expositions du Périgord, ZAE de Saltgourde. Venue: Piacenza Expo, Padiglione 2. Venue: Hala Miejskiego, Ośrodka Sportu i Rekreacji, ul. Mickiewicza 49. Venue: Auditorium of the Slovak Health University, Bernolakova 8. Information: [email protected]; or [email protected]; schedule. Information: Franca Zuccotti, 3484565967; [email protected]; or Anna Maria Giussani, 02/9528104; [email protected]. Venue: Royal Melbourne Showgrounds, Epsom Rd. Club: Shepparton Agricultural Society Inc.
Venue: McKinnon Pavilion, Shepparton Agricultural Show Grounds, 275 High St.
Information: Bec Dajcic, 0422677544; [email protected]; schedule (DOC). Venue: Bendigo Cat Pavilions, Bendigo Showgrounds, Holmes Rd. Information: Rebecca Dajcic 0422677544; [email protected]; schedule (DOC). Venue: Bracknell Leisure Centre, Bagshot Rd. Public Show Hours: 12:30 p.m. to 4 p.m.
Information: Mrs. Carol Pike, 01344 424418; [email protected]; schedule (PDF). Venue: Wistaston Memorial Hall, 75 Church Ln. Information: Ms. Janet Tonkinson, 94 Meadow Ln., Trentham, Stoke-on-Trent ST4 8DJ; 01782 641190; schedule (PDF). Venue: Bugbrooke Community Centre, Camp Close. Public Show Hours: 12:30 p.m. to 5 p.m.
Information: Mrs. Marlene Buckeridge, Stari House, Leeds Rd., Langley, Maidstone, Kent ME17 3JG; 01622 863032; [email protected]; schedule (PDF). Venue: Sports Connexion Leisure Club & Venue, Leamington Rd. Information: Mrs. Jean Huyton, 77 Habberley Rd., Kidderminster, Worcestershire DY11 5PN; 07846 080681; [email protected]; schedule (PDF). Venue: Academy Sports Centre, Arboretum Rd. Information: Mrs. Isobel Walker, 53 Meadowhouse Rd., Edinburgh EH12 7HW; [email protected]; schedule (PDF). Venue: Lockmeadow Market, Barker Rd. Information: Sue Barrett, [email protected]; schedule (PDF). Venue: Knocklyon Community Centre, Idrone Ave.
Information: Mrs. V. Brooks, The Rowan, Fairymount, Crettyard, Via Carlow, County Laois; [email protected]. Venue: National Exhibition Centre, Halls 17 & 18. Information: Mrs. Lynda Ashmore, 7 Ledstone Rd., Woodseats, Sheffield S8 0NS; [email protected]; schedule (PDF); Website. Venue: Gymnase d’Artagnan, avenue d’Artagnan. Information: Ms. Elodie Valentin, 06 51 92 38 51; [email protected]; schedule. Information: Ms. Marie-Thérèse Szmidt, 03 27 86 53 85; [email protected]. Venue: Espace Aixagone, village des automates. Information: Ms. Michèle Casaburi, 06 17 94 09 01; [email protected]. Venue: Parc des Expositions, hall 8. Information: Ms. Agnès Bonnet, 06 86 46 93 60; or Alexandra Valbonesi, [email protected]. Venue: Parc des Expositions 1, rue du Pdt. Robert Schuman. Information: Ms. Catherine LeTerrier, 02 38 75 24 06; [email protected]. Venue: Salle du manège Ordener. Information: Ms. Claudine Pissy, 03 22 09 44 72; [email protected]. Information: Lisa Dickie, [email protected]. Venue: Taipei World Trade Center, No. 6 Songshou Rd. Information: Afra Chang, +886 2 8258 2288; [email protected]. Venue: Morgantown Center, 6180 Morgantown Rd. Information: Brenda Russo, (610) 775-5027; [email protected]. Venue: Nagoya International Exhibition Hall (Portmesse Nagoya), 2-2 Kinjo-futo, Minato-ku. Information: Hisako Imaizumi, +81 536-23-2799; [email protected]. Venue: EventCity, Phoenix Way, Stretford. Information: Rhian Morris, [email protected]; or Sue Howson, [email protected]; schedule. Venue: Frank Mayborn Convention Center, 3303 N. Third St.
Information: Deb Spencer, (832) 453-3876; [email protected]. Venue: Ferndale Events Center, 5715 Barrett Rd. Public Show Hours: Saturday, 10 a.m. to 5 p.m.; Sunday, 9 a.m. to 4 p.m.
Information: Tracy Hisel, (360) 520-6627; [email protected]; schedule. Information: Karen Kuo, +86 188 6230 0240; [email protected]. Venue: The Centre at North Park, 10040 W. Addison Ave.
Information: Donna Lawver, (708) 721-0455; [email protected]; or Geri McKerlie, (847) 609-6169; [email protected]; schedule (PDF). Venue: Palcavicchi-Grand Hotel Bologna E Dei Congressi, Via Ponte Nuovo, 42. Public Show Hours: 9:30 a.m. to 6:30 p.m.
Information: Alessio Pasquini, [email protected]; schedule. 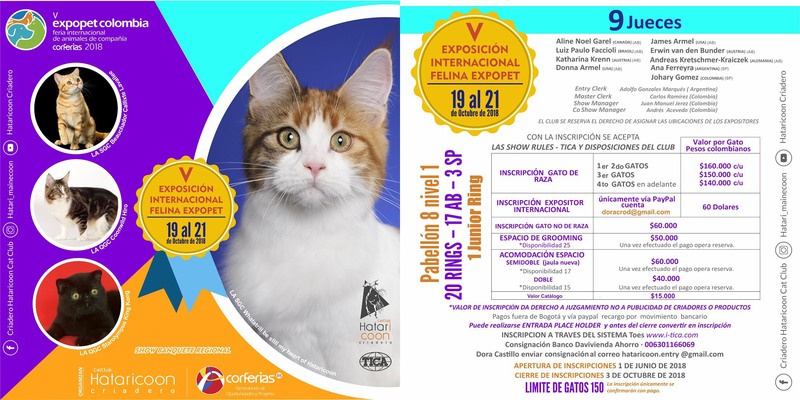 Venue: Corferias Recinto Ferial, Pabellon 8, Nivel 1, Cra. 37 #24-67. Information: Juan Manuel Jerez, [email protected]; schedule. Venue: Centre de foires de Québec (ExpoCité), 250 Wilfrid-Hamel Blvd. Information: Audrey Hobbs, (207) 224-2207; [email protected]. Venue: Parc des Expositions, allée Fernand Jourdant. Information: Bruno Chedozeau, +33 6.83.83.00.97; [email protected]. Information: Jenny-Margrethe Vej, [email protected]; schedule. Information: Karin Roth, [email protected]. Venue: Arcadia Masonic Center, 50 W. Duarte Rd. Information: Sue Case, (602) 334-3285, [email protected]; or [email protected]; schedule (PDF). Public Show Hours: Saturday and Sunday, 9 a.m. to 4 p.m.
Information: Stephanie Smith, (423) 261-2049; [email protected]; schedule. Venue: Placer County Fairgrounds, 800 All American Blvd. Information: Gloria Mahan, (209) 745-6302; [email protected]; schedule. Venue: Parc des Expositions, 1 rue du Président Schuman. Information: Damien Bourreau, [email protected]. Venue: Otaku Sangyo Plaza (PiO), 1-20-20 Minamikamata. Information: Akiko Ishimura, [email protected]. Venue: Laramie County Fairgrounds, 3967 Archer Pkwy. Public Show Hours: 9 a.m. to 4 p.m.
Information: Kyla Herbst, (970) 390-9353; [email protected]; schedule. Venue: Sava Center, Milentija Popovica 9. Information: Milorad Petkovic, [email protected]; schedule. Venue: XL Center, 1 Civic Center Plaza. Public Show Hours: Saturday, 10 a.m. to 6 p.m.; Sunday, 10 a.m. to 4 p.m.
Information: Tania Antenucci, (705) 796-8482; [email protected]; schedule.